Ok But Did Drake Perform at Your Bat Mitzvah? Maybe it was worth it to say you were fired for being "too real for 'reality' TV". Oops She Googled Some Corn? Looks like Britney Spears decided to use a fairly lazy google image search result for grilled corn, and of course the internet noticed. Ever wonder what Donald Trump searches for on Google in his spare time? Wonder no longer, friend. We've got you covered. Speaker of the House, Republican Rep. John Boehner announced his resignation from the office today. What's so crazy about it is how many people from both sides of the aisle are greeting it with jubilation. Monday marked the 30th Anniversary of the first episode of The Golden Girls, the show where four older ladies live together, eat pastries, and make d*ck jokes. The premise is so great, Betty White is a cult phenomenon even now (although we prefer to think it's from her Mary Tyler Moore Show days). And could there be a bigger fan of semi-ironic, mid-80's, octagenarion television than Marvel's very own Deadpool? The Merc with a Mouth took to his new movie's twitter to congratulate Dorothy, Rose, Blanche and Sophia the only way he knows how: with dolls! Jack White has beef. At least according to Patrick Carney, drummer for The Black Keys. In a string of since deleted tweets Carney claimed that White approached him in a bar in New York City and tried to start some sh*t. ...I don't fight and don't get fighting but he was mad!!! Three exclamation points means serious business. There has long been rumors and disparaging things White has said about The Black Keys, suggesting that they stole the sound he pioneered with his band The White Stripes. Both bands are two pieces, both have some rockin', bluesy tunes. There's some similarities, but there's similarities with many, many bands. It'd be slightly similar to boy bands brawling. Things took an even spicier turn when White released a statement to Entertainment Weekly refuting the claim. "Nobody tried to fight you, Patrick. Nobody touched you or 'bullied' you. You were asked a question you couldn't answer so you walked away. So quit whining to the Internet and speak face to face like a human being. End of story." "The bully a**holes who made me feel like nothing. Music was a collaborative and non competitive thing. So, to get macho bullsh*t from within the musical community makes me angry and sad." Talked to jack for an hour he's cool. All good. So, sleep easy, children. Those blues-ish musicians will never fight again. To add a little more context to this terrible music spat, here's an adjustment the AV Club made to the above picture. It's been kind of a mixed bag for athletes making the difficult decision to come out as gay. It helps to have Hermione on your side. Keegan Hirst recently broke many boundaries, coming out as Britain's first openly gay rugby player. For a macho guy in a macho sport with macho teammates and macho fans, it wasn't the easiest of decisions. He's received a lot of support for the decision, marking even more how much the world has grown in a short time. And in a beautiful and classy move, Emma Watson congratulated Hirst in a series of tweets Aug. 18. Hirst spoke to the Daily Mirror about coming out Aug. 15. Respected prop Keegan, 27, reveals the secret torment of dealing with his sexuality while carving out a career in one of the world's most macho sports. Speaking exclusively to the Sunday Mirror, the dad of two tells of the moment he finally found the words to explain to his wife the reason they could no longer be together. And he talks emotionally of the support he got, not only from her but also from his rugby team-mates. The 6ft 4in captain of West ­Yorkshire side Batley Bulldogs said: "At first I couldn't even say 'I'm gay' in my head, let alone out loud. Societal attitudes take a long time to evolve, but that evolution couldn't happen without people like Hirst taking initiative and influential people like Watson supporting them. Zayn, you really messed up this time. Just look at what you've done to your fans. How are we ever supposed to trust you again? 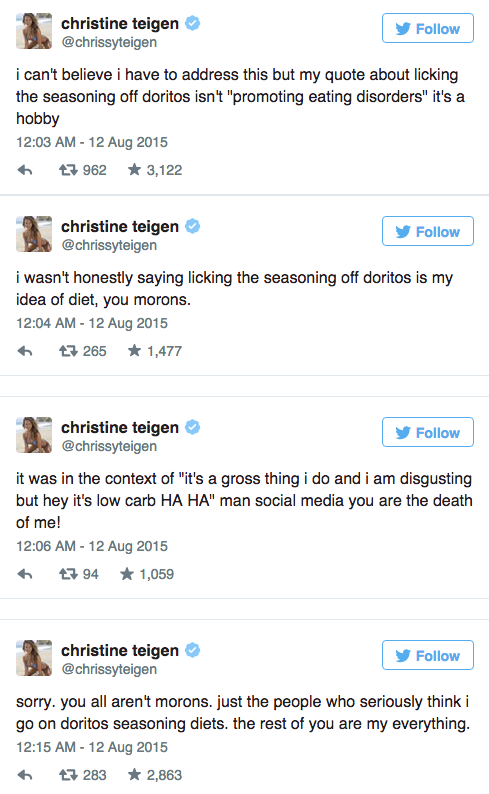 In case you were wondering, supermodel Chrissy Teigan does in fact NOT live off a diet of cheese dust from Doritos. She made this very clear on Twitter today, clarifying a statement she made in a recent interview. "I lick off the nacho cheese seasoning and put the [Doritos] back in the bag. You get all the flavor, not all the carbs," she told Delish.com. But apparently people thought that was literally all she eats. And there you have it. Chrissy Teigan doesn't solely subsist on Dorito nacho cheese. Bummer. If you're upset, here's a GIF to cheer you right up. Iggy Azalea on Twitter is like the bizzaro J.K. Rowling on Twitter. They both should have far better things to do with their time and money, yet both actively engage with apparently whomever reaches out to them on the social network. The difference is that Rowling likes to set fans straight and guide them to better understanding, whereas Azalea just picks fights. 'The Last Airbender' is to movies what Iggy Azaelia is to music. For whatever reason, Iggy decided to set things straight. @Jazalean @superherofeed I think its another one of those jokes only middle aged men who get boners over comic book movies understand. That would not stand for the honorable heroes of Superhero Feed. They felt the dire need to stand up and defend themselves. You can insult my joke Iggy but at least I wrote it. They referred to the reports that Iggy had a lot of help writing her breakout hit Fancy. After pushing way back a concert tour and dealing with a flopped summer song with more Twitter feuds, you'd think Azalea would spend her time scheming on how to avoid that great, yawning pit of mediocrity that reaches for her career. Everyone's gotta pick their own fights. Twitter deity, and great comedian, Patton Oswalt took one for the American team Aug. 6 and live-tweeted his perspective on the first Republican primary debate.